Dreamy Chocolate Fudge Cake, the softest chocolate fudge cake, draped in a chocolate fudge icing and adorned with chocolate caramel biscuit balls. Do you ever dream of chocolate? I do! 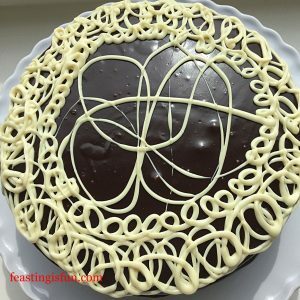 Whilst making and then tasting this recipe there was only one name that fitted the incredible flavour, taste and texture experience, that is this Dreamy Chocolate Fudge Cake. Dreamy Chocolate Fudge Cake every bit as good as it looks. 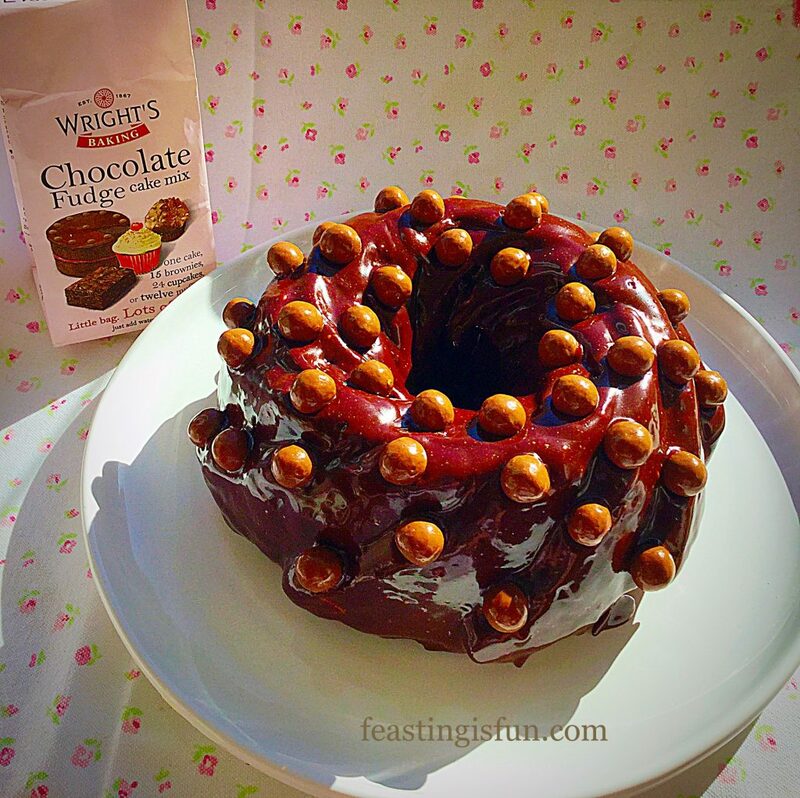 This incredibly tasty cake was made using Wright’s Baking Chocolate Fudge Cake Mix. I love having a few Wright’s Baking Mixes on hand, especially for days like today. Having just spent 2 whole days, floored by the monster of all migraines, today I was able to get up. If you too suffer with migraines you may find this helpful Migraine Not Always Sunshine And Roses. My therapy, comfort and pleasure is to bake and cook. Tackling a cake, from scratch today was beyond me. So instead I used my trustworthy packet mix to create this Dreamy Chocolate Fudge Cake. Yes, you may thinks I’m nuts, wanting to bake after spending the weekend in pain, in bed, with the curtains closed. For me though, being in the kitchen is freeing. My creativity is allowed to run wild – for the record I had absolutely no idea if I could pull off the icing – yet that’s part of the thrill. 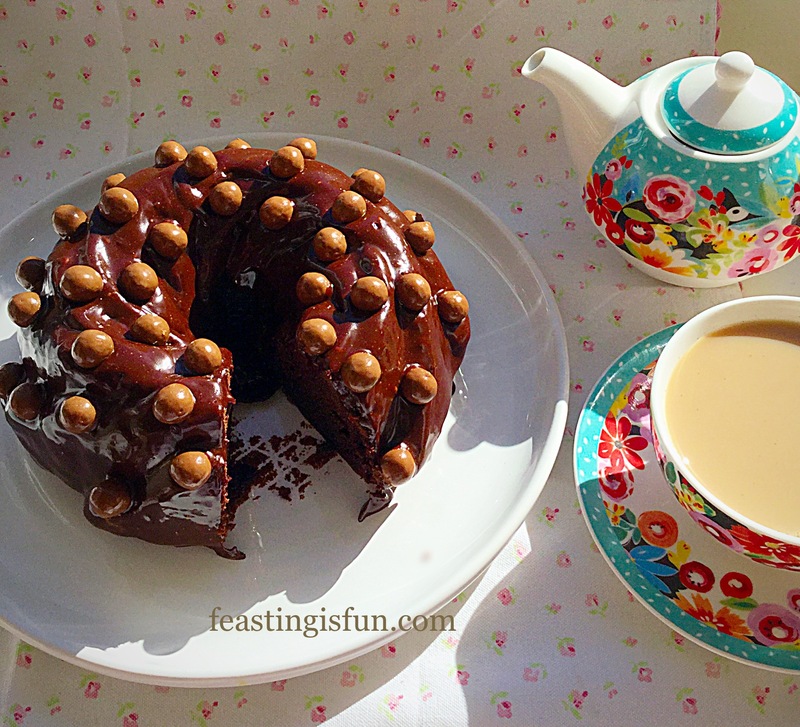 If it hadn’t of worked I’d have switched to plan B.
Dreamy Chocolate Fudge Cake the cake of my dreams. Ooh this cake is good. 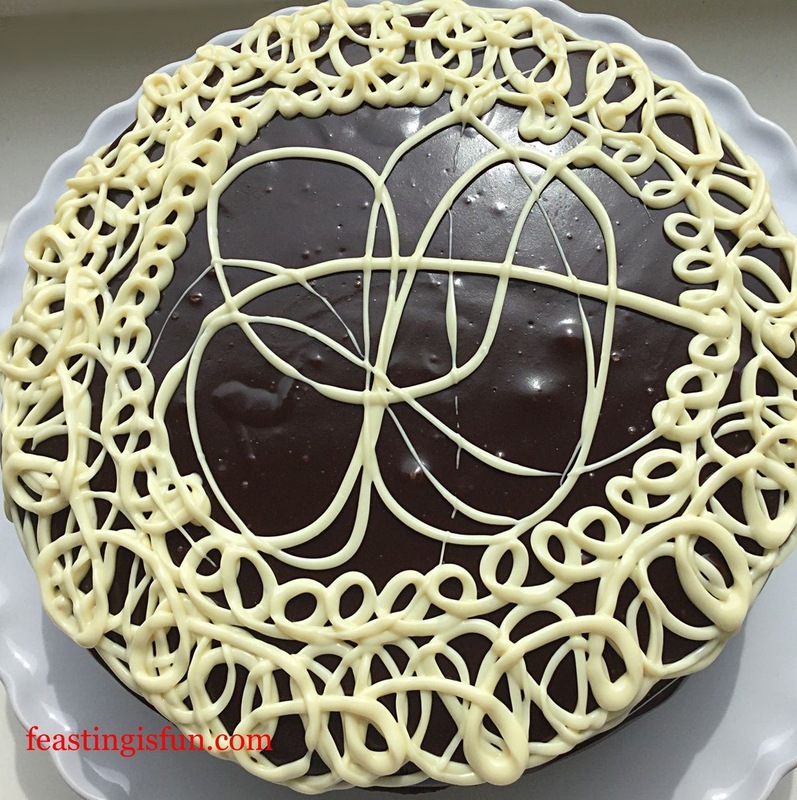 If you have a boyfriend/girlfriend and you want to impress them, I mean I’m not guaranteeing a marriage proposal, but, this is the cake you need to make them, or anyone you know who loves really good chocolate cake, that you simply want to treat. 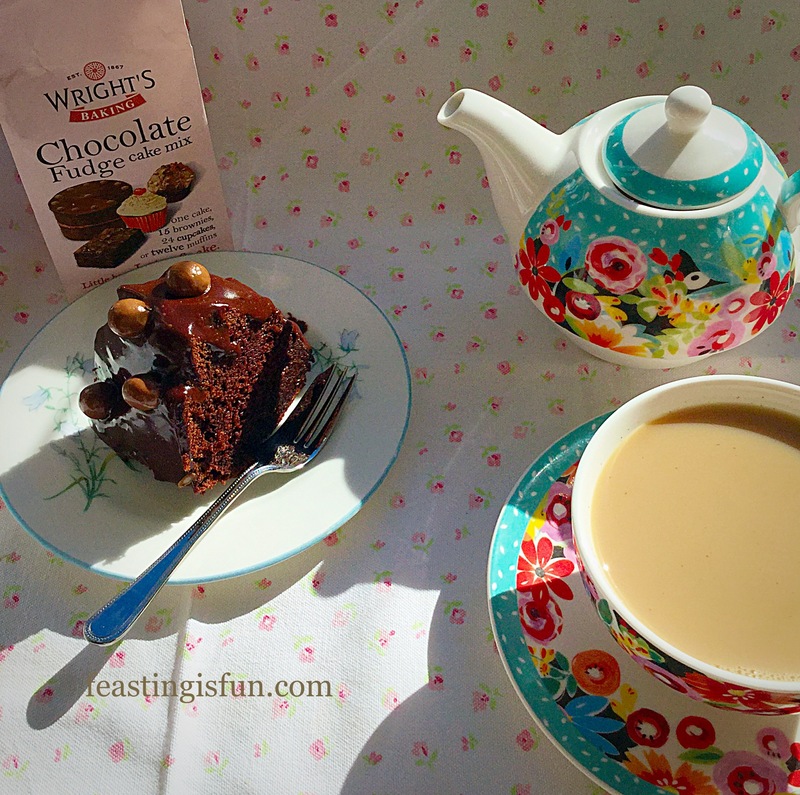 I have said it before and I’ll say it again the Wright’s Baking Mixes that I’ve used taste like homemade. In fact I’m already wondering how I can make a cake this delicious from scratch, because at the moment I don’t have a recipe to match this. 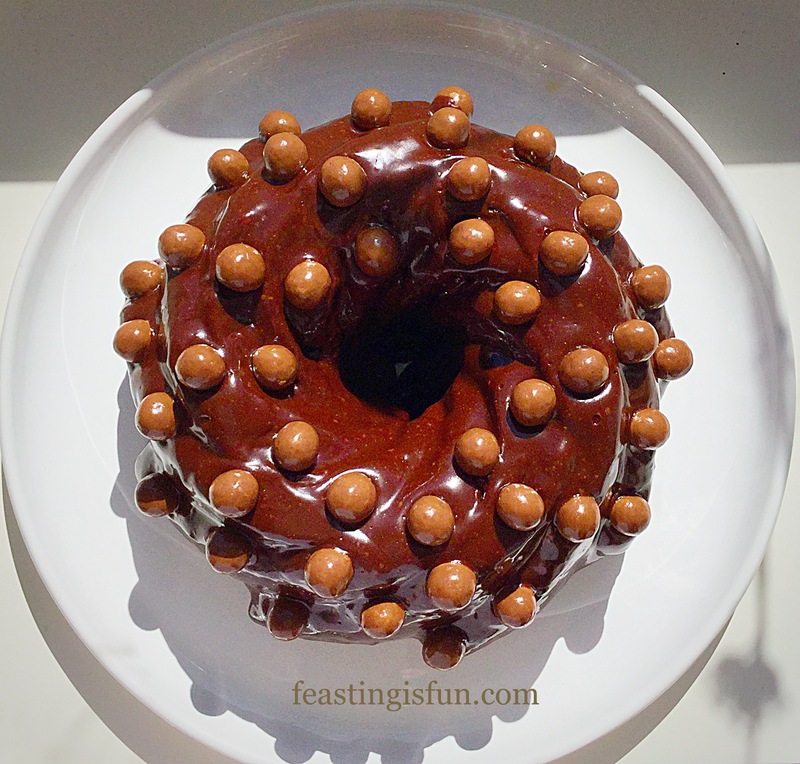 The closest would be my Chocolate Fudge Bundt Cake. What you’ll need for this Dreamy Chocolate Fudge Cake. 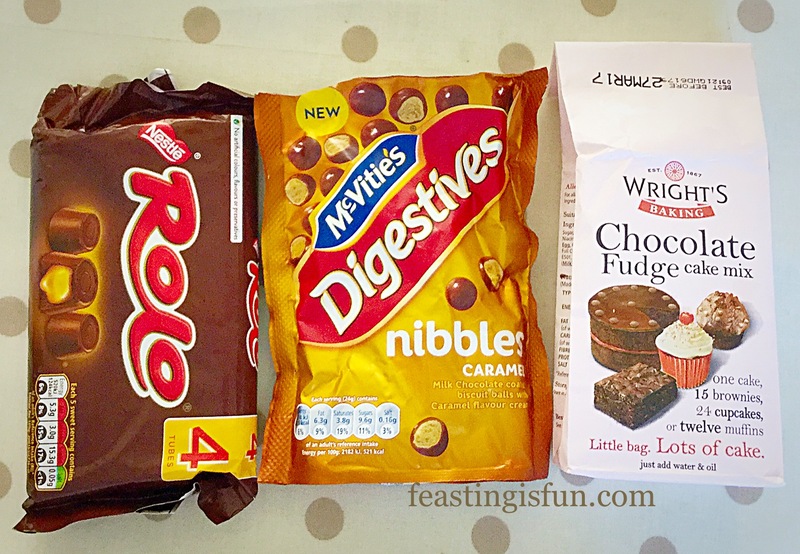 So I found these new McVities Digestive Caramel Nibbles and they work perfectly on the cake. The contrast between soft fudgey cake/icing and crunchy biscuit balls is fabulous, however, if you can’t get hold of them I’d suggest Malteser’s or Minstrel’s. Both would work well with the flavour of the cake and give that additional crunch! 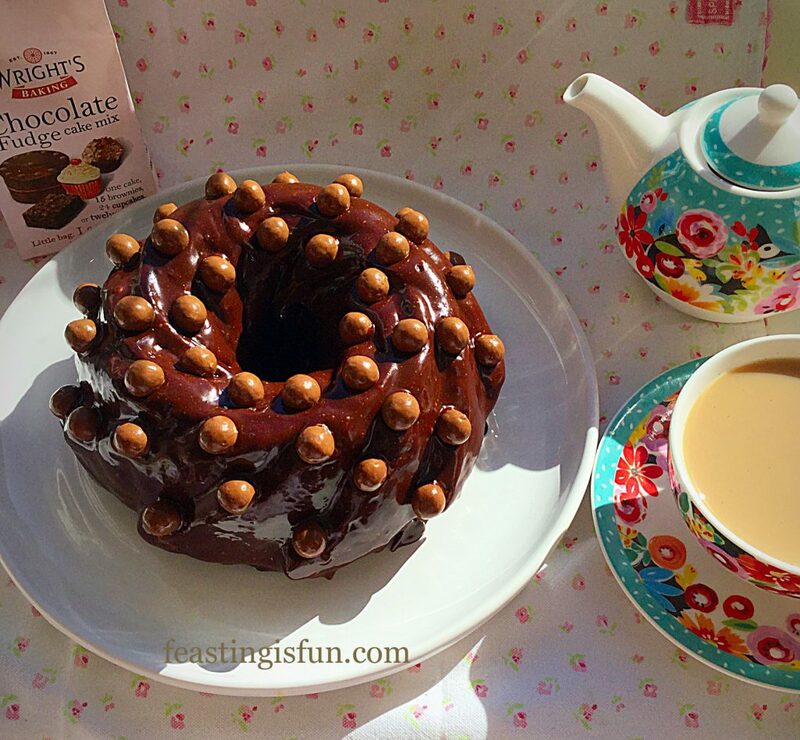 I have used a silicone Bundt style mould, you can use a standard 20cm/8″ round cake tin. Grease your mould/tin well. I prefer to use melted butter and apply it with a pastry brush. In a large bowl add the water, oil and cake mix and whisk according to the packet instructions. 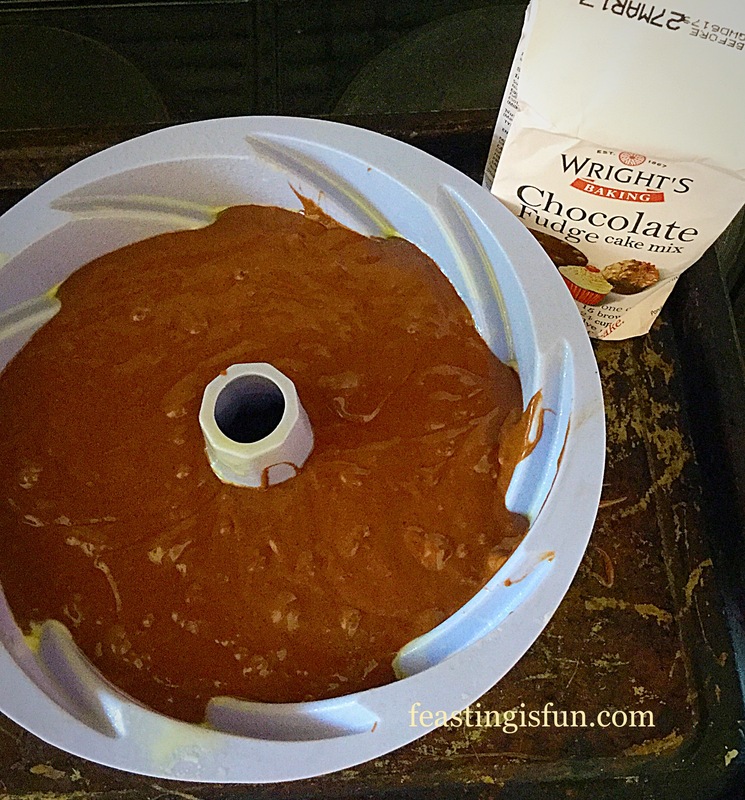 Pour the smooth, chocolate cake batter into the prepared mould/tin, wiping away any splashes or spills. Dreamy Chocolate Fudge Cake ready for the oven. When using a mould I like to place it on a baking sheet first. Place the cake into the middle of the oven and bake for 50-60 minutes. I start checking at 45 minutes. The cake is baked when an inserted skewer comes out clean. My cake took 50 minutes to bake. Once baked remove the cake from the oven an allow to cool in the mould/tin for 10 minutes. Turn the cake out onto a cooling rack and allow to cool completely. Dreamy Chocolate Fudge Cake cooled and ready to be iced. Place a small saucepan with an inch of water in the bottom over a medium heat. Place a heatproof, I use Pyrex, bowl on top of the saucepan ensuring that the bottom of the bowl doesn’t touch the water. 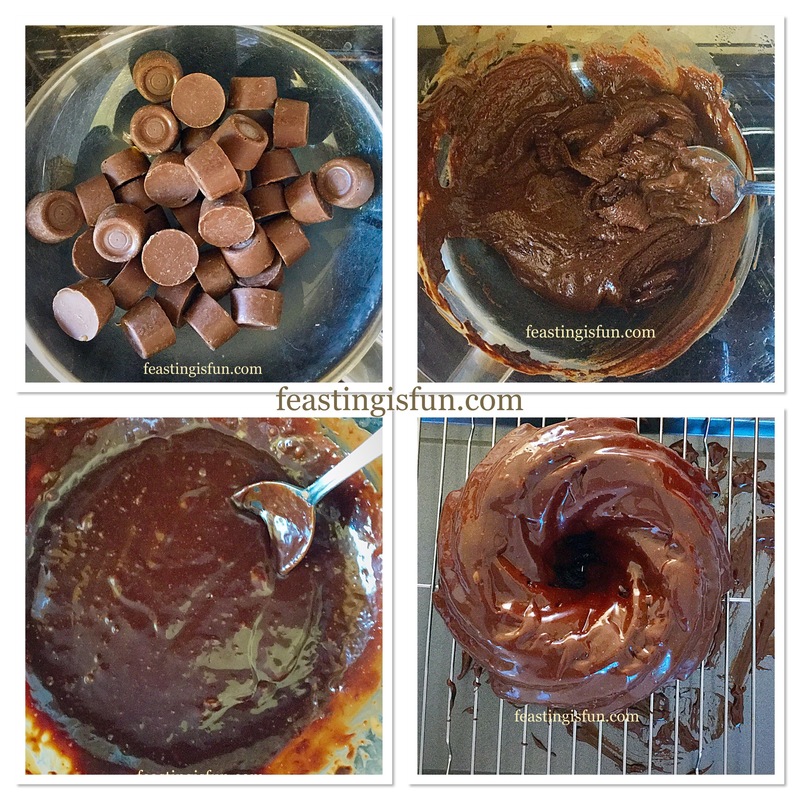 Add the Rolo’s, chocolate and cream to the bowl. Stir until you have a melted, glossy chocolate fudge icing. Steps showing the chocolate fudge icing being made and then covering the cake. Place the cake on a rack that fits over a clean baking tray. The idea being that as the icing drips through to the tray it can be scooped up with a spoon and poured back over the cake. 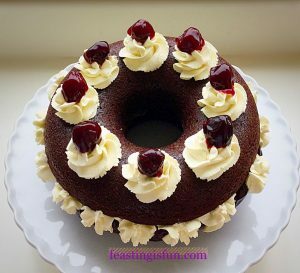 Start at the centre of the cake, evenly spooning the thick, fudgey icing around the middle and gradually turning the cake to ensure little air holes, that appear, are covered. Continue spooning the icing around the cake – I actually turn the whole tray/rack around so that I can get a clear view. When all the icing from the bowl has been used the cake should be 3/4 covered. 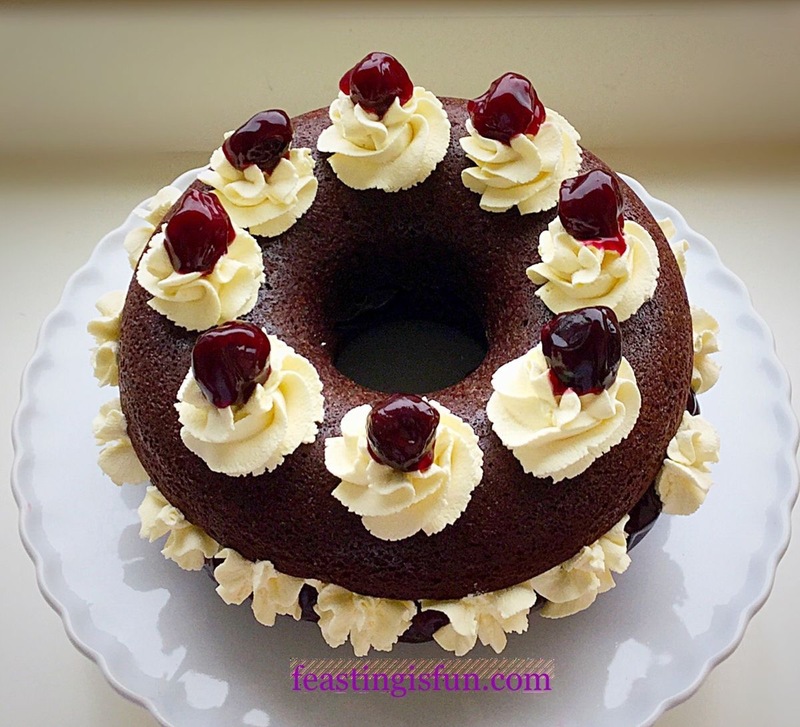 Scoop the remaining icing from the tray underneath the cake – you should be able to slide the cooling rack along the tray – spooning the remaining icing over the last remaining parts of exposed cake. Allow the cake, once covered to sit on the rack for 10 minutes, you’ll be surprised how the definition of the swirls become visible again. 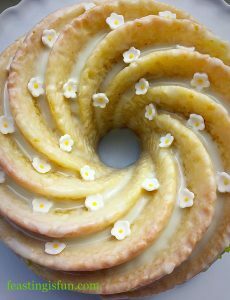 Using 2 flat implements – I use a fish slice and palette knife – transfer the cake to a plate or cake board. Again starting in the centre and taking care to keep to the symmetry of the mould, add the caramel biscuit balls. 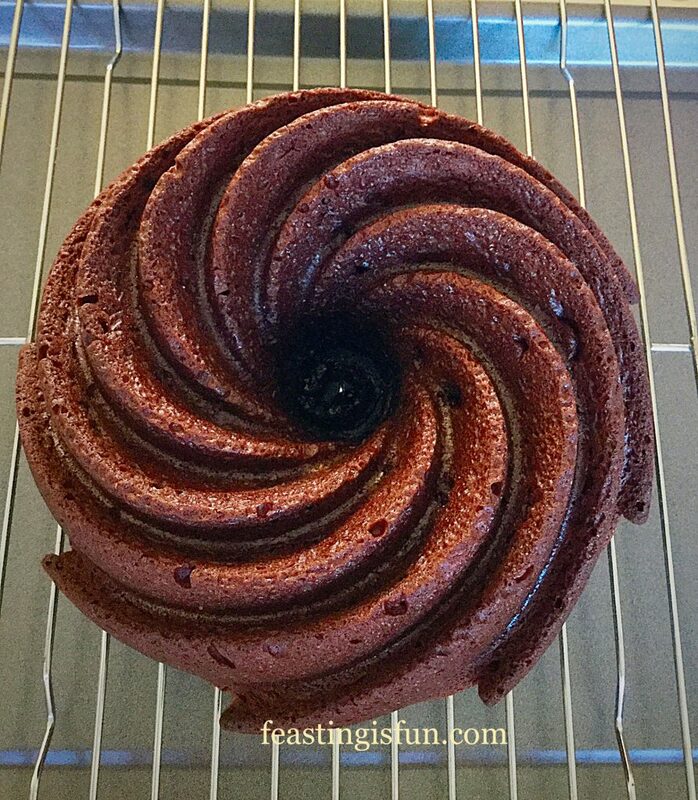 I like to complete the centre then decorate each swirl. Dreamy Chocolate Fudge Cake beautiful and delicious. The cake is ready to serve straight away, although it can also be chilled for a thicker, denser ganache finish. I wasn’t prepared to wait! 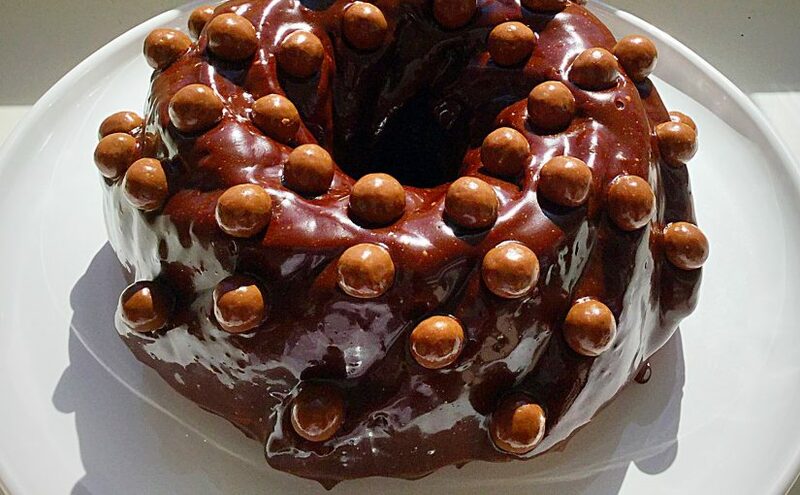 The only thing this cake needs is a good cup of tea to accompany it, ooh and preferably the love of your life, or family and friends to share it with. Unless you’ve had a really, really bad day! Dreamy Chocolate Fudge Cake, who will you share it with? I love how making a cake feels like a feast. It feels like a celebration, even if you are having it for Afternoon Tea on a Sunday. Whatever you are making, baking and creating in your kitchens, have fun and remember food always tastes better when it is shared! Wright’s Baking provided me with the mix to make this cake. 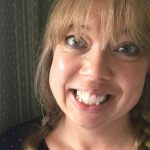 All content, views, opinions, photographs and recipes are my own. I was not paid to write this post. Please see my Disclosure Policy. This looks so delicious and it is so beautifully decorated. I will definietly try making this this summer!